I am to the point in holiday planning that some of my idea/ recipe books come off the shelf. I have recently purchased sourdough starter and have the flour flying in the kitchen. I have started gifting loaves of bread just yesterday! This year my daughter has a variety of high school gift exchanges and secret Santa duties and she is (finally) interested in baking, making of snacks and home made hot cocoa mix. 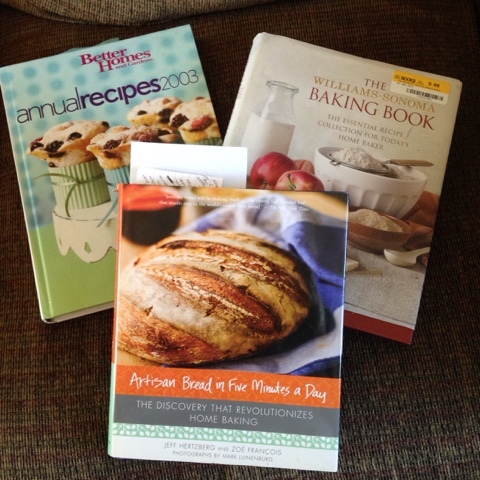 These books as well as many others share our favorite family recipes. I will include a family favorite for hot coco mix for gifting. All ingredients well mixed in large bowl then packaged in smaller gift giving amounts perhaps with a mug, peppermint stir stick and instructions for prep. Here goes: 1 1/2 cups mini milk chocolate chips, 1 1/2 cups powdered sugar, 1 1/2 cups powdered coffee creamer, 1 1/2 cups powdered chocolate flavored drink mix. 1 1/2 cups powdered instant dry milk, and lastly 2 cups mini marshmallows. One serving is 2 tablespoons mix with 1 cup boiling water. Stir well to melt chocolate and enjoy.